Linda, from "It all started with paint", shred her gorgeous dining room. 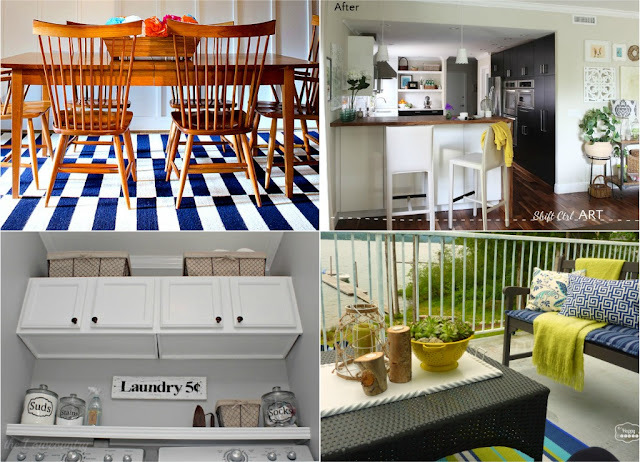 K from Shift CTR ART, shared her stunning kitchen makeover, go check out the before and after! Alana, from Life in the low country, shared her beautiful laundry room makeover. Krista, from the Happy Housie, shared her stunning deck. Oh MY, I fell in love with her outdoor furniture and that view! Elisha, from Lovelishares, shared her awesome jewelry display/holder. 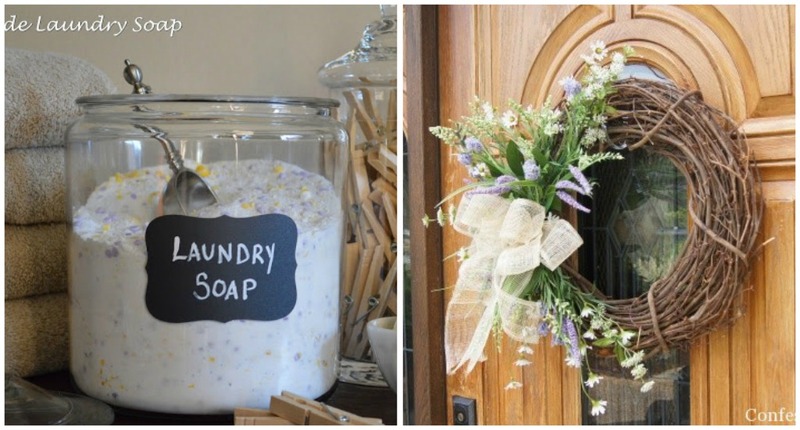 Angela, from Hickory Trail Blog, shared her recipe for laundry detergent. Christy, from Confessions of a serial diyer, made this stunning wreath for under $10! Callie, from Callie's Crafts, shared this beautiful dresser she refinished. Debbie, from Loving Life One Day at a Time, shared her $25 dining table find from Craigslist, which she then refinished to look this stunning. 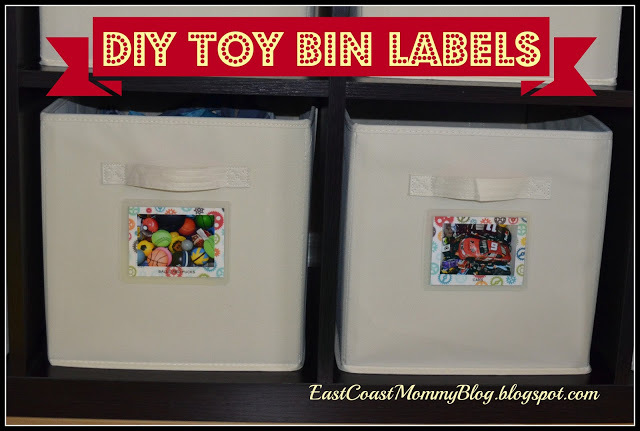 Gina, from East Coast Mommy, shared how she organizes her kids toys. She made labels by taking pictures of the toys. I really need to do this, that way, things can go back where they belong. 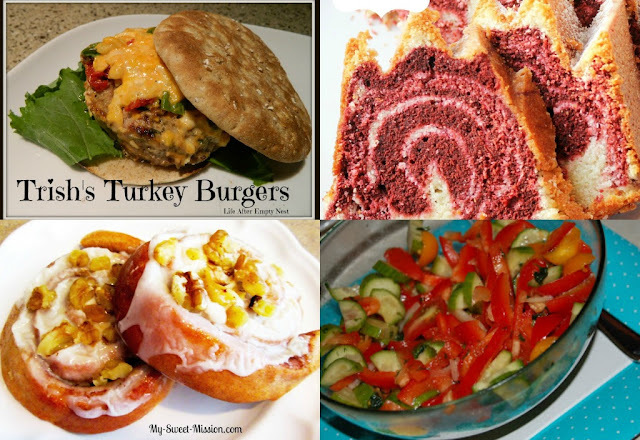 Sharon, from Life After Empty Nest, shared these delicious looking Turkey burgers! Kate, from I Heart Eating, shared this melt in your mouth looking Red velvet swirl bundt cake. Heather, from My Sweet Mission, shared these yummy Whole Wheat Cinnamon Rolls. Aksana, from Play Dough and Puzzles, shared this mouth watering cucumber, tomato and bell pepper salad. Hi Rita. Thank you so much for featuring my Glazed Whole Wheat Cinnamon Rolls, I really appreciate it! Thanks so much for the invite, Rita! Great features! Hope you're having a wonderful weekend! Thanks for the fabulous party, Rita!! Thanks so much for having me today. Hope your week is wonderful. Thanks so much for inviting me to your party. I hope you are having a great weekend! Thanks a million for featuring my Turkey Burgers! They are one of my favorite burgers! Hi Rita! I came upon your blog while browsing others. Happy to meet you and know you a little through your beautiful home. I loved your green and orange guest bedroom-I am partial to these colours- they are those of the Indian flag ! Thanks for hosting your party-just linked up and 'followed'! Hope to see you at my place-when you can make it ! Awesome features! I had to go check out that pretty laundry room. Thanks for hosting the party! Thank you so much for hosting. I see you next Sunday! Thanks for the party Rita. Heading over to check out the lovely features! Thanks for hosting your party. Have a terrific week! Thanks for featuring my Stenciled Dresser and for this great party! I'm sharing my summer yard tour.